If you’re anything like us, you simply can’t stop getting enough of the glitz and glamour of Hollywood where the stars never set! 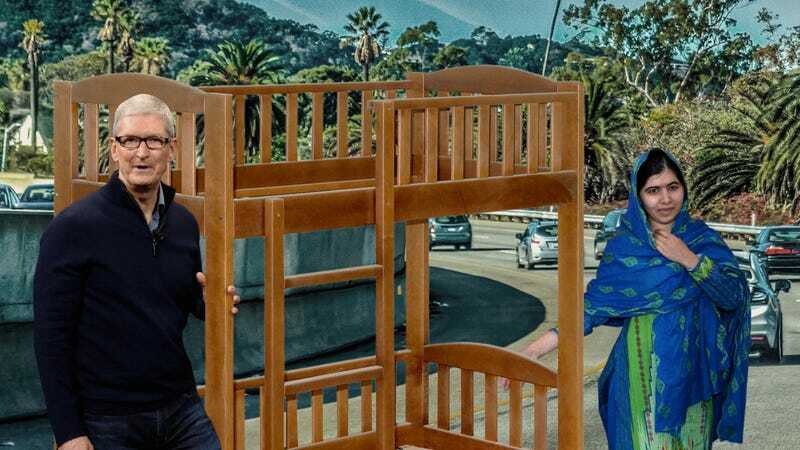 And this latest round of news out of Tinseltown is going to have you swooning and loving celebrities: Tim Cook and Malala Yousafzai were just spotted together dragging their new bunk bed down the Santa Monica Freeway! You heard that right! The tech whiz CEO from Apple and the Nobel Peace Prize winner from Apple have gone halvsies on a double-decker bed and are dragging it along the freeway towards the beach! Yes ma’am! Yes sir! Yes ma’am and sir! Starry-eyed sources have confirmed the hot goss: Tim Cook and Malala Yousafzai are the hot new duo of friends as they slowly and with great effort drag their glitzy new bunk bed down the highway in rush-hour traffic. Yep, it’s getting bright here in Hollywood town because the paparazzi are flashing their cameras to see Malala screaming at Mr. Cook to please drag the bunk bed over to the side of the road for a second because a trucker just threw his cigarette out the window and she wants her friend Tim to take a drag on it to toughen him up for the remaining 11-mile trip! Sources on the scene say the glamour is coming in caps lock today because our favorite Apple CEO and favorite Apple women’s rights activist have reportedly gotten their bunk bed stuck in a pothole and Malala is now sitting at their bed’s attached desk writing down possible solutions to their problem to send to Congress while Tim Cook kneels on the top bunk and says a prayer of only obscenities to God for help. It’s all in the town that calls Hollywood its name, baby! And it looks like Tim’s glamorous prayer has been answered because his mom has pulled up next to the bed-dragging pair and has offered to drive her expensive car into the bunk bed at full speed to knock it out of the pothole! Call the Olsen Twins and tell them “leave” because there’s officially a new Hollywood Dream Team in town and it’s Malala and Tim and their scraped-up bunkbed! That’s the hot news from hot hot Hollywood: the town where celebrities live and murder each other! And if you want to catch a glimpse of this boiling celebrity pie you better get on the Santa Monica Freeway now because Tim Cook has just fallen over and is now lying on the top bunk while Malala (Yousafzai) drags it all by herself! Only in Hollywood and always in Hollywood! Sources say Malala (Yousafzai) is dragging the bed at 35 MPH now that Apple’s brightest Tim Cook isn’t slowing her down and she’ll be to the beach very soon where she and Tim will bury it. And thus sets the sun on another glamorous day in the swanky land of hot hot Hollywood. You better love it!